Acknowledged author Denise F. Polit PhD FAAN wrote Nursing Research: Generating and Assessing Evidence for Nursing Practice comprising 814 pages back in 2016. Textbook and etextbook are published under ISBN 1496300238 and 9781496300232. 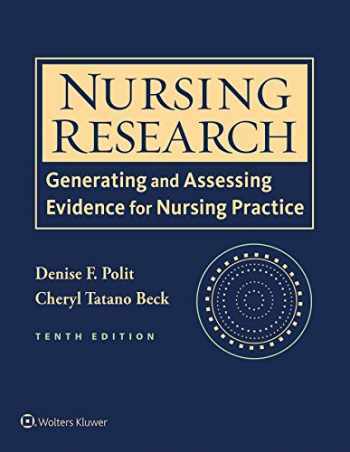 Since then Nursing Research: Generating and Assessing Evidence for Nursing Practice textbook received total rating of 4.5 stars and was available to sell back to BooksRun online for the top buyback price of $31.37 or rent at the marketplace. Nursing Research: Generating and Assessing Evidence for Nursing Practice, 10th Edition has been updated to incorporate new methodological advances and, to the extent possible, substantive examples used to illustrate concepts will be from articles published in 2013 to 2015. The organizational structure introduced in the 9th edition will be maintained — i.e., content focusing on quantitative research will be in Part III, and content on qualitative research will be in Part IV.A valuable ancillary package is available for instructors and students via thePoint. They include PowerPoint slides with relevant tables and figures, test bank, journal articles, case studies, critical thinking exercises, strategies for effective teaching, internet resources, and glossary.